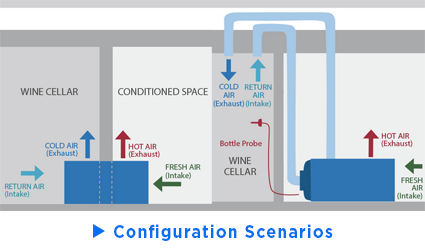 CellarPro's AH6500SCh ducted cooling units (3/4 Ton Nominal) are suitable for wine cellars up to 1,750 cubic feet in both commercial and residential wine cellars. This ducted unit uses 10-inch ducting and requires insulated ducting on the cold side. The 1,750 cubic feet cellar size assumes that the cellar is constructed with insulation of R19 or better in all walls and ceiling (ie no glass or uninsulated concrete), a setpoint of 55F inside the cellar and ambient temperatures up to 85F outside the cellar. Ducting wil add additional load and should be considered in the sizing calculation. Performance testing shows that this unit maintains optimal cellar temperature and humidity conditions in extreme conditions up to 110F more effectively than similar units from competing brands. AH6500SCh units also are significantly quieter than comparable units from other brands. Visit our Learning Center for data tables, performance charts and product comparisons among different brands. When the hot side of the unit will be exposed to air temperatures below 40F, our Compressor Heater (P/N 1727) is a required addition to protect the compressor. CellarPro AH6500SCh Cooling Unit (P/N 7090). CellarPro engineered the AH6500SCh ducted cooling system to provide maximum cooling power and adjustable humidity control for cellars up to 1,750 cubic feet. The evaporator and the condensing unit each can be ducted up to 100 equivalent feet (50 equivalent feet per duct.) Designed for internal installations, the AH6500SCh includes a variable-speed fan on the evaporator with a low setting for quieter operation and a high setting for maximum power. This unit has a horizontal configuration for installations in locations with limited height and/or vertical constraints (eg above the ceiling in an attic). CellarPro Air Handlers are engineered to be ducted with 10-inch insulated ducting on the cold side (evaporator) and/or 10-inch ducting on the hot side (condensing unit), allowing the equipment can be located out-of-sight where it won't be heard. Excess condensate is managed through an extra-large 1/2" drain line, amply sized to reduce blockages. Factory-installed Expansion Valve ensures maximum operating precision and range. Cooling system is fully-charged with refrigerant and ready-to-use out of the box. CellarPro AH6500SCh units are fully-charged and ready to use out of the box. These cooling units are designed to be ducted up to 100 Equivalent Feet (50 Feet per Duct) with 10-inch ducting . 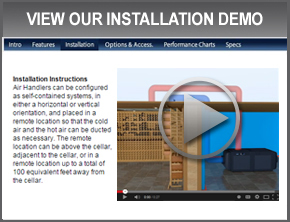 CellarPro's horizontal configuration allows multiple ducting alternatives, as follows. Collars or grills for EXHAUST (ie Supply) are located at the front (shown at left), top or rear of the cooling system, and are interchangeable to meet your specific requirement. Collars or grills for INTAKE (ie Return) are located at each end (left: evaporator, and right: condenser), and include professional-grade air filters to protect the unit. When not ducted, the hot side of the cooling unit (condenser) requires 12 inches of unobstructed space in front of the coils, and requires approx. 600-700 CFM of ventilation when installed in a confined space. For installations in environments below 40F, AH6500SCh units require our Compressor Heater (P/N 1727) . The cold side of the cooling unit (evaporator) should never be exposed to temperatures below 32F. I noticed when we were working on this unit that the internal parts were all very high quality which was really nice to see. I have 3 of the Cellar Pro units installed around Memphis and all, except the glitch on this one, have hummed along beautifully. I would never use anything else now that I have installed a few. I have an architect working with some out of town folks and he has referred them to me to build a custom home and they want a wine room. I assure you if I get the job I will be using a Cellar Pro. If you guys have a comment area on your web site, please direct me to it and I will be happy to give a referral. I was always concerned with any warranty issues on these units and I am much reassured now. I am attaching a link to my web site and you can see some of the wine rooms I have done. I have about 3 more I need to photograph and add. Several of the ones shown have split systems done by a local HVAC contractor prior to my being introduced to Cellar Pro. They have more or less worked well, but were very expensive and cost prohibitive to any but the most affluent. The Cellar Pro systems allow anyone with a true interest in wine and a limited budget do a nice wine room. Purchased this unit to install outside a customers wine room. Installation was very easy and unit is working like a charm. This is the second CellarPro I have installed and would not use anything else.